Under the present planning regime there seems to be little likelihood that development will be permitted along side or front boundaries due to the perceived issues I’ve noted earlier and, as always, the effort it takes to introduce a radically new approach to housing. Development of the New District of Doha was carried out with planning solutions new to the State. This was possible due to the area being created from the sea and, initially, falling outside the remit of the Ministry of Municipal Affairs. However, novel solutions weren’t forced on the new house owners but were worked through and developed with them. Nevertheless, I believe there are considerable benefits and hope that this type of house might be investigated in more detail as not only does it produce better privacy and security than villas developed centrally, it also represents a more Islamic solution, particularly in providing a more introverted, private development for the families living there. The building I’ve used to illustrate the principle of boundary development is no great work of architecture and is not developed from an internal plan as it should be. It is used as a notional device to investigate possible arrangements between sites. You will also see that I have elected to use traditional features, particularly at roof level where there is considerable use of badgheer to bring air onto the roof surface, improving comfort there. To give an idea of scale, the badgheer is two metres high, preventing casual viewing over it. It shows two stories of development with a third storey containing both a roof facility for enjoyment by the family as well as an area for plant and equipment at the other end. On the first floor level, lighting is with high level windows protected by quarter spherical shades that both protect from the sun as well as giving privacy. The same type of solution can also be used to ensure that houses don’t overlook each other’s gardens. On the roof I have also shown a notional glazed light well with sliding solar protection screen. On the ground floor there is a main entrance to the house as well as vehicular access to the site, alongside which is a dikka on one side where men of the house might relax. There would also be access from here to the majlis. Refuse and metering are adjacent to this access. An obscured glass screen is shown on the ground floor for lighting a space in the interior, along with high level, clerestory lighting. I mentioned in the preceding paragraphs that the main entrance to the house is the larger one to the left of the diagram, and that the majlis is to the right, associated with the vehicular entrance. This is not necessarily the manner in which such a house might be laid out. Many Qataris prefer the main pedestrian access to the house to be the most important in its design and lead to the majlis, and that the women of the house either use it when there are no men around or use an alternative access. In this case it would be that associated with the vehicular entrance. As I have written elsewhere, the access to the majlis should be quite separate from the women’s entrance and it might be thought wrong to have it tucked around the corner as I have shown in the sketch accompanying the preceding paragraph. Talking with Qataris I suspect that either might be a workable solution, depending on the habits of the family, but certainly there has to be separation in some effective manner. The main entrance solution leading to the majlis tends to be a solution to villa designs where there is no separate outside majlis, women of the house moving round the building to enter either through the kitchen or through a separate entrance. In this sense the majlis is similar to a Western drawing room. and the latter will contain the garaging and refuse as well as a proportion of the storage. The buildings for storage and servants’ accommodation are used to separate the service yard from the private elements of the household at ground floor level. There should be no possibility for looking from the service yard to the garden where the family should be able to enjoy their privacy. The two linking uses which might separate the public and private areas would be the cooking area and the servants’ accommodation. Both of these should obscure through vision, the latter through the use of doors carefully located and swung. This sketch illustrates the character of façade treatment on the garden side of the house. The ground floor openings are illustrated as being large and may even be continuous. At those times of the year when the weather is not too hot or too cold the windows would be opened and the life of the family can be enjoyed both inside and outside the building. Solar shading would need to be provided to protect the windows during the hottest times of the year so I have shown a simple trellis, though this might take a number of different forms constructed with a range of materials, perhaps extending some way into the garden area to optimise shading and reduce the ground floor temperature adjacent to the building. This top sketch illustrates the possible character of a cul-de-sac were it to be surrounded by two or three storey development developed up to the front boundary. I have used the same design for each plot as is shown above and repeated it for ease of illustration. In reality different designs would be anticipated for each plot, but the overall impact on the character of the cul-de-sac would be similar. What is apparent is the essentially urban character of the cul-de-sac. What is not so evident in the lower illustration, is that there is a much greater feeling of space at the back of each house, the buildings being farther apart than they are within a layout where houses are located centrally within their plots, as at present is the rule. The difference in distance is considerable – approximately fifty metres compared with the present twenty-five metres. There may be a feeling looking at the sketches that each house looks at a continuous terrace of housing but, with careful consideration of window design there should be no direct view at the windows of houses opposite. In any case, fifty metres is a considerable distance. In order to maintain some degree of privacy with regard to neighbours, it is important that overlooking should be prevented as far as practicable. Both the present Senior Staff and Public houses are designed as villas, most of them having unguarded windows which both allow neighbours to see into houses as well as permitting views from those houses into neighbours’ houses as well as the private areas around the houses. The result of this has been a number of complaints between neighbours and, more important, the inability to enjoy houses and their surrounding grounds properly. Islam requires that neighbours are considerate of each other and, in the past, people have deliberately constructed their houses with the issues of overlooking in mind. But in addition to privacy, this concern has meant that houses are not ostentatious, and that neighbours’ requirements are taken into account at all times. focussing views into their own gardens to take benefit of the landscaping and associated uses. use of mushrabiyah to allow in light while giving some degree of privacy to occupants. There are a wide variety of ways in which these can be dealt with, but I thought it might be useful to use a couple of examples to illustrate the thinking behind the resolution of the problems of privacy. The first illustration is a quarter spherical shading device which could be constructed of glass reinforced concrete or similar material, fixed directly to the façade. Here I have shown it positioned at two alternative heights. The higher one would produce a clerestory lighting effect, allowing the façade wall to be available for a wider range of interior design treatments. Any views from outside the building up and into it would only show a ceiling. The lower placement would be the more traditional placing with the bottom of the shade at normal window cill level. This protects the window and directs the view from inside the building into the garden of the property, preserving neighbouring privacy. The second of these illustrations shows a box unit with, in this case, fretted perforations similar to some of the simple mushrabiyah effects that are in relatively common use in Qatar. The unit gives considerable privacy from the front and side though, in the design I’ve used here, the boxes are open on one side which would allow some degree of oblique viewing, putting neighbours at some risk to their privacy. Two of the units have perforations on the closed side, and one is completely closed in order to provide complete privacy to the neighbouring site. The boxes would have perforations on the top element to improve ventilation and lighting. The variables of the units’ thickness and hole size and shape would be available for amending in order to provide the optimum settings for privacy, ventilation, lighting, material, structural integrity and fixing. This has the advantage of introducing colour, movement and smell for both the users of the room as well as those passing below the planters. Watering points could be incorporated but would introduce potential difficulties in terms of maintenance, as would the necessary drainage holes. This simple hood device is included to illustrate how flanking elements might be used to prevent viewing into the adjacent side neighbour’s gardens. As illustrated it does not provide privacy to neighbour’s gardens at the end of the garden though this would be easy to accommodate by bringing down a shade device on its face, a relatively easy effect to calculate. In a sense it would then be similar in its concept to the quarter spherical device illustrated above. Finally, this shading variation provides a solution to many of the difficulties that might be perceived in the shade examples given above. Louvres, shown here installed horizontally, can be used both to bring light into the window – as they do at the top of the illustrated screen – as well as directing views down into the garden, as they do with the lower part of the screen. Mechanised, the louvres can be adjusted to optimal conditions. The flanks of the unit prevent viewing into the neighbouring properties as they do in the example preceding it, and it would be simple to provide solar or rain protection to the top of the unit. limited to just the opening or cover several openings or even the whole of a building or a part of a site. The foregoing has dealt with the treatment of openings to the building, but the issues relating to maintaining an equable environment within the building must also look at the whole of the skin of the building. This is normally the place where the conditions obtaining between the interior and exterior of a building are moderated. Regrettably the construction industry, together with building consultants and clients, have created an architecture which requires extensive servicing – particularly from air-conditioners – for the interiors to remain comfortable throughout most of the year. To a large extent this is due to three factors: the use of inappropriate materials; the inability of architects to respond to the challenge of creating responsive buildings; and the requirements of clients to create monuments. Openings within walls of modern buildings represent a technical change from traditional buildings. In the past openings did not have glass but relied on wooden shutters for security and privacy. Wrought iron bars gave additional security, particularly to windows in walls giving onto the outside of the building. In some parts of the world, external screening has been adopted as a means of reducing the solar load on buildings as well as modifying glare and enhancing the quality of light entering rooms. This photograph shows how external louvres are used to protect the external wall and windows of a building and how, in this case, they can be manoeuvred to fine tune the internal lighting effect. Although mushrabiya are common in Qatar they have not been used in this way, probably because it was only possible to construct them as immovable elements, usually in naqsh, though sometimes out of timber where they were used to afford privacy to occupants as well as amend the flow of air, usually to roofs. Even within the relatively minor opportunity created by the introduction of an opening in an external wall there is the possibility for a wide variety of treatments of the opening both in the materials used for screening, their orientation and their positioning relative to the opening. Such screening is not limited to attached screens but may incorporate all kinds of devices which give the required effect, and can extend to screening of the building itself. Screening could include, but might not be limited to free-standing, floating as well as novel devices in which there is considerable latitude for inventive design of architects. moderate the amount and quality of light within a building by bouncing light onto a ceiling where it is more usable for residents. Of course louvres or screens can also be used vertically as opposed to the horizontal louvres shown here, and may also be used on a horizontal plane, protecting roofs, verandas and balconies. Louvres can be fixed or manoeuvrable, the latter manually or electronically controlled in response to residents’s instructions or pre-programmed in response to environmental conditions. Whether fixed or manoeuvrable they can be designed at different scales to respond to a variety of functional or aesthetic requirements. I have spent some time discussing the need to keep people from looking into buildings as well as looking from buildings into neighbours’ properties. This has implied shielding the window openings by a variety of techniques or making them small, as used to be the practice. Windows are traditionally also needed for ventilation as well as views, though this is something I will discuss elsewhere. daylight is useful through the day and across the seasons as it produces the most natural form of lighting. This can be relatively flat, but this character can be useful in many areas, for instance in areas where art is being created and north lighting is sought for its even character and particular colour temperature. Natural lighting also reduces the requirement for artificial lighting and its attendant costs for both the State and the householder. In hot countries, particularly ones where there are problems associated with security and privacy, introducing useful light into interiors can be difficult. One device, however, is relatively easy to introduce and can be adapted for a number of situations by locating the window in a vertical wall in a position where it will not create a privacy problem. These three diagrams illustrate a notional solution to the problem. This first diagram shows how light can be bounced off a horizontal cill and be reflected onto the ceiling of a room, which becomes a secondary source of lighting. The same diagram also shows how lighting can be bounced off an external horizontal floor adjacent to the building, also reflecting onto the ceiling. Both are useful ways of improving lighting within rooms. The second diagram, below, shows how lighting can illuminate, or be bounced off, a wall to make that wall a secondary source for lighting the room. 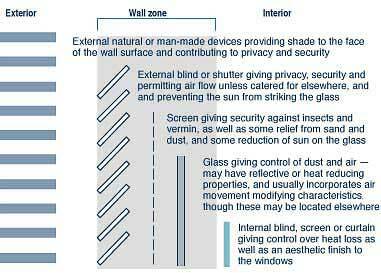 The returned wall or, in the diagram above, the returned cill, create a deep reveal which helps in providing privacy. I’m sure that I will have mentioned it elsewhere, but light in the Gulf tends to have a more effective horizontal than vertical component when compared with light in Europe. The reason for this is that in hot climates with clear skies there is still considerable dust and atmospheric pollution at low levels, and which is illuminated by the sun, creating a lighting source. In Europe where there is usually cloud cover, the sun illuminates the cloud in a similar way in which a tungsten light bulb is illuminated. The whole of the sky, therefore, tends to act as a light source, its vertical component being similar to its horizontal component. In the Gulf for much of the year there is little light coming vertically but a considerable amount horizontally, with the exception of the sun itself, of course and, for much of the day the sun is at a relatively high position compared with, say, Europe. Nevertheless, this third diagram show how using roof lights and reflecting the light off a wall is another way in which room interiors may be lit. One of the great advantages of using reflected light is that it is softer and there is less contrast for the eye to deal with. It has been known for centuries that, when a window is viewed from inside a room, there is considerable contrast between the window mullions and the open part of the window. In the past this was dealt with by splaying the edges of the mullions in order to reduce this contrast and, in the Arab world, by using mushrabiya which, with its circular cross-section, has a similar effect. Using walls and ceilings as secondary light sources is an excellent way of creating a light source with no contrast. While the use of openings in vertical walls is the preferable way of leading light into buildings, light may also be introduced from the roof, though this is more difficult to effect. Perhaps it is more accurate to say that it more difficult to control though, with the advent of automatic and electronic controls, this may now be easier and should be considered. Above, I mentioned the possibility of using light tubes. These are increasingly being used in the West as an inexpensive way of illuminating those parts of buildings some distance from an external wall. They make particular sense in the Gulf where buildings tend to be larger and where, therefore, some parts of the buildings can not receive lighting other than from some vertically-introduced source. through the use of a passive stack system. Air-conditioning is the way all buildings are now being treated in the Gulf. In fact the trend is moving to more temperate parts of the world though, with the concern for environmental issues, there is a countervailing movement seeking to use natural methods for conditioning buildings. The interesting point to me is that artificially conditioning the air in a building – warming it in winter and cooling it in summer – now leaves only two relatively short periods in the year when the house might be naturally ventilated: a part of Spring and Autumn. These periods, including winter, are times when Qataris really appreciate the smells of the natural environment, or the taste, as they term it in Arabic. It seems counter-intuitive to have artificially conditioned air circulated around buildings, the interiors of which additionally contain a number of modern materials which each has a smell of its own and which collectively contribute to the background smells of recent buildings. My next point has to do with the opportunity to use opening devices which are not windows. Doors would be an obvious example of controllable opening devices but there is also a history of smaller devices being used both in the West as well as in Qatar, the latter a mechanical flap associated with badgheer. Although simple to use in principle, as are doors and windows, they can be relatively sophisticated in order to deal with issues such as wind speed and direction, as well as dust. The difficulty with operating many ventilating devices is that they have to be manually operated as householders like to have individual control but, conversely, find it annoying to have to fiddle with controls all day. Of course, many ventilating devices can be electronically controlled nowadays, but this area has not yet developed to any great extent in the Gulf. As I have mentioned elsewhere, the main difficulty with ventilating buildings lies in the conflict between the need to introduce fresh air and the desire to keep the interiors of buildings – with their valuable contents – clean and safe in a cost-effective manner. Dust is perceived to be the natural enemy of the householder and many would prefer to have the house closed in order to prevent its entrance despite the fact that most households have servants, one of whose duties it is to keep the house clean. The third ventilating system might be developed from the stack effect. This effect is created when a vertical pipe or chimney is heated by the sun, the internal heated air moving upwards, drawing up cooler air from any volume at its base. This is also referred to as a solar chimney. It’s a possible solution to ventilating houses under certain conditions. The particular benefit offered by the stack effect is that it works well when there is little or no wind movement outside. The badgheer was developed as a means of bringing down relatively clean air into traditional houses whichever way the wind was blowing. The higher the intakes are positioned the better, as the amount of dust contained in the air diminishes with increasing distance from the ground. To some extent the traditional badgheer operates the stack effect as the tower, heated by the sun, encourages air to rise when there is little or no wind. However it is not designed to do this and the system has difficulties caused by a conflict in air currents at the base of the tower when there is any wind being brought down. an outlet facing away from the wind direction. The openings which govern air-flow to the stack can be difficult to manipulate but again this can be electronically operated to optimise ventilation flows. The stack effect operates when there is a significant temperature and, therefore, pressure differential in the stack, inducing the warm air to rise through the system. It is a useful method for ventilating and passive cooling buildings. Such systems are becoming more common and viable with the increasing interest in environmental concerns and the reduction of carbon dioxide emissions. The chief problem in the hot months of the year is ensuring a supply of cool air. Obviously cool air within the building which moves up the stack must be replaced by cooler air entering it. However, air temperatures outside a building can be significantly higher than are comfortable and must be cooled first. It also helps for the dust to be removed. Theoretically this could be effected by using the geothermal mass of the ground to reduce the temperature of air ducted through it from as cool a part of the site as possible: somewhere shaded and with significant planting around it to create a localised cool micro-climate. A couple of metres down the ground is a relatively constant temperature and providing a dust trap at the outset and cooling the air as it is ducted to the building would provide a relatively cool source of air to the building. There are other ways of improving the performance of buildings in hot climates. Elsewhere i have discussed the theoretical approach to designing buildings in hot climates where the external wall system has a heavy internal element and a thin external sheath. This allows the internal wall to be used as a heat sink, the thermal mass effect dampening the swing of temperature through the twenty-four hour period. note that the high thermal mass solution, illustrated by line ‘c’ shows a significantly lower temperature range which creates a more even feeling of comfort within the building. In some parts of the world a Trombe [link to pdf] wall is used to have a similar effect. This is usually a dense, thick wall located with a glazed wall adjacent to it through which the sun heats the wall creating a reservoir of energy which can then be used as a source of heat with air circulated through it, and the building, through the use of low energy fans. This system is best suited to cool climates or the cooler months of the year. Developments along the front boundary are relatively easy to design compared with development along the side boundaries. The main problem with such development relates to the difficulty of providing adequate fenestration and ventilation on the side of the house adjoining the neighbouring plot. This diagram and that below illustrate the relationship between front and side boundary developments two storeys high. Roof development has been omitted for better clarity. providing a ventilation shaft or atrium. Traditionally the manner in which this would be accomplished is by the incorporation of atria into the mass of the building. Of course there is a third alternative: it would be possible to resolve the problems of providing light and air by the provision of solar tubes and air-handling plant respectively. The former is a relatively new technology and places no burden on resources other than the need to provide vertical shafts for its incorporation. Air-handling and the concomitant heating and cooling systems is a normal adjunct to modern buildings in Qatar, but places a heavy burden on energy sources as was amply demonstrated in the first buildings to be constructed on the New District of Doha. But, related to this particular issue, the problems are perhaps more psychological than physiological and relate to the quality of comfort provided by the rooms facing the shafts or walls. However, they are a tradition in the country due to the introverted nature of traditional development and there is every reason to think that they would work relatively well in Qatar. In terms of their provision the footprint of the building would need to be enlarged to compensate for the area taken by the light wells or atria. Assuming that there are two light wells of a notional five metres square each taking up two floors of covered space, there will need to be a one hundred square metre addition made to the house – fifty square metres to the footprint. On a thirty-five metre wide site this would mean a little less than one-and-a-half metres added to the footprint of the building. they are capable of leading fire from one part of the building to another. the latter factor a natural result of the efforts to maximise usable floor space. There is much that can be done to ameliorate these problems and produce usable designs. In this respect, the first thing for designers to understand is that atria in this part of the world are usable spaces, not utilitarian or left over areas of the building. They replicate the external spaces found in residential housing both in tight urban areas as well as more rural developments in that they are used as part of the adjoining internal rooms. In the above example I have sized them at a notional five metres square, but smaller sizes will work effectively and, oriented correctly, they will be very effective. What they should not become is ventilation shafts or light wells. An additional or alternative solution is to plan the interior of the building with a corridor on the boundary wall side of the building, essentially creating a single-side accessed plan with lighting and ventilation on the opposite, external, side of the rooms. The corridors can be lit, on the first floor, by roof lights and, on the ground floor either by artificial lighting or by solar tubes. Of course, a corridor design can be supplemented by atria to give more light and, perhaps more importantly, access from more rooms to related external spaces. This graphic illustrates how the ground and first floor corridors might be notionally illuminated by roof or top lighting on the first floor, and solar tubes on the ground floor. The solar tubes would only be required where light was not introduced through, for instance, a stairwell or atrium. Provision would be made for the ducts within a servicing area which would also take other services. Note that the graphics do not take account of design customisation such as raised parapet walls, badgheer, nor the likely development of the roof to accommodate utility equipment and recreational spaces. I have shown the light tubes as being vertical but because of their highly mirrored internal finish they can be led at angles. An obvious location for the outlets would be the centre of the corridor ceiling rather than its edge as illustrated. In general there seems, therefore, to be no insurmountable problem to designing either on the front boundary or the side boundary. In both circumstances there are a number of issues to resolve but the design of both would produce houses that would satisfy the living requirements in terms of both internal spatial requirements as well as privacy, the latter one of the most important factors in Islamic design. All three of these are issues that can create difficulties between neighbours whether the houses are designed as villas or boundary developments. Again, Islam requires neighbours to be considerate of each other – but sensible planning can help minimise or optimise potential problems. Sound can be a difficulty between neighbours, whether from appliances or from general activities such as play. Designers are generally aware of this and should design accordingly with regard to both airborne as well as impact or structure borne. While this can be dealt with in the design process, people’s behaviour on their own property can be more difficult to manage. There are, for instance, an increasing number of complaints in the West relating to neighbours who hang wind chimes in their garden. One person’s pleasure can be another’s torture. Safety, in this regard, has to do with problems such as that illustrated here. Many Qataris keep animals. These might be animals which provide milk or eggs, and there are also a number of Qataris who maintain large aviaries for personal enjoyment. Traditionally, Qataris kept, of course, camels, but also sheep and goats, donkeys, hens and pigeons. These might still be kept, perhaps with the exception of donkeys which were used only for porterage. But there are now more exotic animals being kept as pets and who are not easily or always contained as the above photo shows where the neighbour’s young cheetah has easily mounted the three metre high boundary wall. Nuisance can take a number of forms, but here I mean it to collect those problems that are not covered by aural nuisance. The main one to consider is olfactory but it should also incorporate noxious discharges and the like. The chief nuisance I am aware of in Qatar has been cooking smells, particularly from servants preparing their own cuisines. Much can be done to alleviate this potential problem by awareness of the potential problem, careful planning and the location of facilities, and the incorporation of cleaning and removal equipment in the extraction systems. Elsewhere I suggested that sites for Public and Senior Staff houses would be based on a thirty or thirty-five metre grid respectively, that dimension being the centre of a two hundred millimetre boundary wall. This is the manner in which these housing types have been carried out in the past. While this might work well enough for villa-type buildings set within a peripheral wall, there is a problem when buildings share boundaries set out in this manner. I believe that the construction of properties on a shared boundary should not use a joint, party wall but should be constructed on their own side of the legal boundary. The reason for this is to safeguard the different structural requirements of each adjacent building as well as preserving the legal entity of each site. This diagram illustrates how that might work with four sites meet at notional legal junctions. So far I have discussed the development of housing on contiguous plot boundaries and noted that it is not popular despite there being a long tradition of contiguous housing development. For the purposes of the above exercises I have also assumed that there is no separation between plots. However, the basic layouts I have proposed depend to a large extent on the permeability of the system for pedestrians. There is also a tradition in a number of Arab countries including Qatar of linking housing at first floor level over pedestrian routes. There used to be a small number of these in the old developments in the centre of Doha which I understand to have linked buildings in joint ownership, or where there were extended families. One I particularly recall as adding considerable visual interest to the sikkak system. It seems logical, therefore, to extend the system here as there are significant advantages from an urban design point of view as well as environmentally with the provision of additional shading and the creation of potential venturi effects for cooling pedestrians. Bear in mind that these two sketches illustrate block massing and have no architectural treatment. The next six diagrams illustrate a notional arrangement of housing located along the front boundaries being taken over adjacent pedestrian routes and onto the boundary wall of the next property. One of the benefits is that the entrance to a cul-de-sac would have cover from the first floor houses, an opportunity for people to stop and talk as well as an opportunity to mark that urban design element of the housing layout. One of the features of housing in Arab countries is the provision of water faucets for the benefit of travellers. It is significant that one or two can be found both in older areas of Doha as well as in the Senior Staff Housing area. The entrance to the pedestrian systems from the culs-de-sac would be an ideal situation to locate them. In urban design terms houses on the front boundary would create a very different feeling in the cul-de-sac from that produced in layouts having the houses all centrally located within their plots, as is the present case. This diagram illustrates, on the left, the present system with the maximum permitted size of house as a two-storey development. On the right boundary-located housing of the same size shows a tighter, urban feel with, conversely, a more open, garden area. In environmental terms, there would be longer shadows cast by the houses and more likelihood of breezes being brought down by the taller buildings. The possibility exists, for instance, to incorporate a ventilation gap between the top of the splayed boundary wall and the building overhead, which would permit air to act in a similar way to that flowing through a badgheer, this time inducing air flow through the venturi effect, sweeping and introducing cooler air or, by the movement of air over the body, the effect of cooling. With regard to the shadows cast by the two types of development, it is instructive to see the crude differences between them. Within the gardens of centrally-located houses there appears to be a significant amount of shadow cast on the north and west of the house. In the cul-de-sac, however, there is little as only the boundary wall will cast any shadow. The combination of the houses being set back from the boundary wall and the small amount of shadow will produce a relatively open, bleak appearance to the cul-de-sac compared with peripheral development. With the house located on the front boundary, however, there is a more immediate presence of the building which will, in practical terms, create a greater amount of shadow as well as produce a more contained space in the cul-de-sac. In these respects it will be more similar to traditional housing layouts than the ‘villa’ style developments that are now so prevalent. In their gardens you will see that there appears to be a very open arrangement with little shade. I believe this to be a benefit as it is here that owners will be able to create the character and amount of shade they wish with the potential for larger arrangements than there will be on plots with the house centrally located and the garden peripheral to it. One of the many benefits of taking buildings along the frontage of sites and across sikkak is that the buildings will catch wind and breezes. With distributed houses in the centre of plots it is true that the breezes will move over and between them but those air movements will be broken up and weakened. With the larger flanks of buildings built along boundaries, particularly when they are joined at right angles, there is an automatically formed wind catcher which can be utilised. The drag effect, illustrated here, will help to turn air movements down onto the roofs of buildings as well as onto gardens and public areas, but the higher flank walls will also channel the air, inducing increased air movements from surrounding volumes of air through the Venturi effect. In addition to this, the construction of buildings over sikkak creates the conditions for accelerating air movements through the sikkak, an important source of cooling as well as clearing of stagnant air volumes. These next three sketches illustrate a notional wind tower located at the junction of two properties that have been extended to join over the meeting of two sikkak at their exit from a cul-de-sac. I realise there may be difficulties relating to legal ownership of the tower element of the design but this should be relatively easily dealt with depending on the manner in which such a tower was constructed. Joint ownership would be one system or, with the right construction, it might be a municipally owned system. Incidentally, I have shown the wind tower as being similar in design to the traditional wind towers, but it might be completely different in design, perhaps pre-fabricated. There are certainly a number of ways in which this could be dealt with. Where the junction of the sikkak system at ground level is formed by raking it at an angle of 45° to make it easier to move around the corner of the pedestrian system – as well as psychologically safer – an open horizontal triangle is formed which can be used to good effect to channel air. If a wind tower is raised at this point, not only will the two flank walls collect and channel air down, but the higher catchment of the wind tower will also bring down the air which is cleaner the greater the height. Their benefit is that the wind tower will act in conjunction with the flank walls to maximise the amounts of air brought down as well as bringing down cleaner air. As I mentioned above, these wind towers would be similar in design character to the burj al hawwa which I have written about elsewhere. The channelling of breezes will brings air down not only to the sikkak, but also to the gardens and public areas, the latter two areas by virtue of the flank walls of the adjacent housing. The next four sketches alongside illustrate how the wind is brought down the burj al hawwa into the junction of the sikkak. Although I’ve drawn the wind illustratively coming in at an angle, the burj al hawwa will direct wind or breezes down to the sikkak from whichever direction the wind is blowing. The triangular opening adjacent to the boundary walls will channel the air into either the gardens or the public space of the cul-de-sac. There is one area of difference between the use here and traditionally. The burj al hawwa will not operate in one of the ways in which it works when integrated into a building: where the solar stack system helps move hot air up and out of the building. I have also shown the wind tower as being built immediately on top of the roof walls of the two houses. Obviously, the higher they are the more effective they are likely to be. The reason for concentrating here on the burj al hawwa is that I believe it to be a very useful device which is nowadays only seen used as pastiche, in other words as a visual device rather than a practical one. There are many examples of it used in this way all over the Gulf. Traditionally the burj al hawwa brought air down to a part of the house from which it was redistributed, there being a simple device at the bottom of it for abstracting the heavier dust or sand particles. Obviously, in a modern house nobody wants any dust or sand brought into the house. However, it does make sense when the burj al hawwa is used to bring air down into an external situation. This helps cleanse the public areas, cools pedestrians and, to a small extent, might help cool the walls of buildings. This series of illustrations, made of the buildings around the head of a cul-de-sac, are introduced here to give an indication of some of the issues relating to this pattern of housing. The buildings illustrated are nominally two storey high with a two metre parapet at roof level, but with no structure associated with vertical access to and from the roof has been shown to keep the illustrations relatively simple. The first relates to exposure. It seems obvious when set in print, but one of the features of living in a hot climate is the amount of heat and the exposure felt when directly under the sun or even reflected from some surfaces. In my experience, those who have not felt this will not consider, nor design for it effectively. Large areas of black tarmac catch and retain the heat forming heat stores which re-radiate heat during the day and continue to do so at night. Using light surfaces for pavement areas reduces this effect but creates a strong radiating effect during the day. These surfaces also increase glare. For much of the year most people consciously or unconsciously search out the shade in order to obtain some relief from the fierce sun. Conversely, as you would expect, the sun can be a benefit in winter and people seek direct sunlight where they can. Shadows are shorter in summer and longer in winter. Whereas people make the effort to stay in shade during summer days which tends to confine pedestrian routes to the edges of development, in winter, their choice of routes is less constrained. Looking at these thumbnail sketches it is easy to get a feeling for this exposure and, particularly, to see the effect the buildings have in the setting of the cul-de-sac. Due to the scale of the cul-de-sac the relatively tall buildings do not overwhelm the public space, but they do have considerably more presence on the street than would a house set back from the boundary. A second issue that differentiates peripheral from central houses is the development of planting on the boundary. It is probable that there will be less planting visible with peripheral planting, though there is no reason why planters might not be incorporated into the front of the building or planting established against the front of the building. Peripheral planting will, of course, benefit those using the sikkak. A third issue is that I have deliberately illustrated the roof walls as being a notional two metres high in these sketches, providing a sitara. Not only does this provide a reasonable amount of visual security and privacy between houses, but it also creates a substantial area of usable space for the residents to use and enjoy. There is no reason why the two metres might not be higher. The main concern that Qataris had in discussion of this feature, was for theft. There are a number of ways this might be guarded against and, as was pointed out, it will be just as easy to climb a boundary wall as a roof wall of the same or similar height. I have not shown vertical circulation systems nor plant structures which would obviously occupy a part of the roof, but they will add more modelling to the buildings. Incidentally, for the purpose of this sketch I have drawn the building with three metre floor heights and a two metre parapet on a thirty-five metre square lot. This brings me to an issue relating to long roof lines. I have written elsewhere about the unfortunate effect this can have and about the traditional way of relieving this effect. Here I would anticipate that stair and plant structures, together with shading structures would be instrumental in relieving long roof lines. In addition to this I believe that a modern version of a badgheer would also assist both the visual issue as well as being a very useful addition to the enjoyment of the roof by the residents of the house. The sketches also show how building on boundaries can benefit pedestrians passing through and around the system. This is not the complete solution to the problem but is intended as an argument for the main structure of the housing. Finally, for a quick comparison, here are two thumbnail sketches of a villa development in the same layout as the peripheral developments shown above, and illustrated with their relevant, approximately positioned, peripheral counterpart scheme. The first pair of thumbnails illustrate the different open characters of the two schemes from within the cul-de-sac. The villa scheme will give the impression of a low density development from the ground perspective, the kind of suburban development that is now the norm through much of the Gulf and certainly represents most of the residential development in Qatar. The peripheral housing on the front boundary gives a feeling of enclosure to the cul-de-sac and a more urban feel to the development. This last pair of thumbnails illustrate the residual spaces given over to the gardens of the two schemes, and the character of their dispersal. They also enable you to understand a little better the problems of overlooking that are being faced in much of the development in Qatar, a problem more serious when the buildings are over a single storey. This has been a problem even with single storey housing and has caused problems from the first developments of single storey Public Housing in Qatar in the nineteen seventies when new residents complained of being able to see from porch to porch as well as between the windows of adjacent properties. This is likely to be a problem when housing designs are not fully considered and privacy considered, but the opportunities for creating problems is obviously more likely with a centrally located house than one constructed on a boundary where no windows are permitted overlooking neighbours’ gardens. Pedestrian paths, or sikkak, are well used by the inhabitants of housing areas. Not only do children play in them but families use them to visit one another, their servants move from house to house on errands, and people travel along them to the main roads where they can find taxis. The additional importance of the junctions of these pedestrian ways is that they provide a sense of security as well as areas where people might stop to talk or play. Traditionally, pedestrian paths are well maintained by the people living adjacent to them. In the old centre of Doha the pedestrian paths, paved with shell sand, were swept and often watered every day. This continued until the Qataris living there moved out to new housing, and the old housing was rented to ex-patriates who failed to continue the tradition. sikkak may be even planted or have water fountains or faucets provided by owners for the benefit of those passing. Under these conditions there is the possibility that the junctions might be enlarged to accommodate pedestrians stopping to pass the time of day, perhaps sitting in shade. Above I have suggested that the splays of adjacent housing might be increased to accommodate a specimen tree to give shade, colour, movement and identity to a particular exit from a cul-de-sac. As I have stated elsewhere, owners are extremely keen to ensure they have the full amount of land given by government, so adjustments would have to be made to ensure this would come about. But it wouldn’t be difficult as something similar was carried out on the Al Sulaiti site. Assuming that houses are not developed on the boundary walls, and that the present policy of constructing villas in the centre of properties continues, then there are a significant variety of treatments that might suit sikkak and, particularly, their junctions. I mentioned earlier that one of the reasons for the use of splays and set-backs is to improve the sense of privacy and security and, particularly, to prevent a pedestrian being able to see from one end of the site to the other. Even then, with Senior Staff housing plots being thirty-five metres square, the length of a boundary wall is long and generally unrelieved apart from any construction elements from which it is made. Usually the walls in the Senior Staff housing areas take the form of a pre-cast concrete column and panel system, the latter usually having a traditional geometric pattern cast into it to create three-dimensional relief and interest while producing a superior finish as can be seen in the top of these two photographs. The photograph also shows the difference in quality obtained when comparing the pre-cast concrete panels and columns with the in-situ concrete work at their base, necessary to provide a level base for the pre-cast work above. The less expensive system is the traditional reinforced in-situ column with blockwork panels, both rendered, but which requires considerable maintenance. This system has been used for a long time and is found on both private and public boundary walls, particularly the walls provided to government public housing. The lower photograph shows the unplastered wall on the right and a newly finished, more sophisticated design on the left. While many of the walls of Public housing are constructed of concrete blockwork, Senior Staff housing has had good quality pre-cast concrete walls erected of posts and panels. This stiffens the walls and visually improves them through a degree of articulation. Nevertheless, the pedestrian paths are relatively long due to the size of the properties they adjoin. The opportunity should be taken in the design of the new walls to pedestrian paths for additional interest to be given through increased articulation, by the addition of planting, water fountains, the incorporation of wicket doors to plots, shading, dikkat and the like. It is difficult to over-emphasise the importance of the pedestrian system. It is a vital element of housing areas; its careful design is imperative. One of the chief characteristics of Arabic housing areas is the relatively narrow cross-section of their sikkak, or pedestrian paths. This has been suggested elsewhere as being partly a response to the manner in which the housing agglomerates over time; residual spaces that permit access, rather than a systematic creation of paths with circulation specifically in mind. It is also a factor of the height of the adjoining walls which, for the most part were relatively tall, discouraging not only overlooking from the street but, specifically, overlooking from adjacent housing. A more specific relationship is that the width of a main public thoroughfare is said to have been set by the Prophet as being seven cubits – about 3.20 metres – as this was the width needed by two laden camels to pass comfortably. I believe this legitimacy was a local ’urf in Medina rather than a part of a shari’a text, the latter of which would have had currency over the Islamic world rather than just in a local area. However, I have the impression that this was the approximate width of the main paths through the old Doha central area. Another important element of the public thoroughfares is that relating to finaa’, the rights given to owners adjacent to their properties. finaa’ gives owners the use of a small part of the public right of way immediately adjoining their property walls, allowing them to tether their animals and unload goods temporarily in that space, usually understood to be about two or three cubits wide – a metre to a metre-and-a-half. Bearing in mind that the sikka was about seven cubits wide, a considerable part of the width of the sikka might be temporarily obstructed. My own observations are that the sikka was kept very clean by the adjoining owners and, even when materials were left outside, they were there only temporarily. It was very common to see women sweeping the shell sand finish to the sikka, as well as watering it, indicating a certain amount of communal responsibility. What was noticeable was that, as soon as the Qataris moved out of the area and let to expatriates, the public spaces deteriorated rapidly, particularly the flooring. One feature I’m not really sure of is that relating to the location of the many dikkat which were commonly established outside properties. These built-in benches are commonly about a cubit and a half deep and must be built within the finaa’. My guess is that it was permitted where there was no danger to the narrowing of the sikka, and where there was a communally felt need for people to sit and meet. I have not been able to confirm this. I should also mention a feature of some residential areas and which is a consequence of the attitude to others of hospitality and generosity. It is not uncommon to find a drinking fountain associated with the outside wall of a residential property, the owner establishing the fountain for the benefit of people passing or working in the open near the property. I have not seen them provided by the municipality, but always as a private feature. The result of this character of cross section is that there is considerable shade within the sikka at most times of the day, with any time the sun shines directly along the length of the sikka, minimised. With deep shadow in the sikkak not only can the greater part of the body be in shade, but so too can the head – an important factor in the perception of comfort. 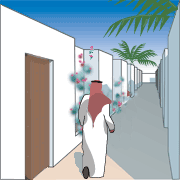 Even with the relatively reflective walls of housing areas the micro-climate within the sikka can be relatively pleasant. Any planting that overhangs the path increases the psychological comfort of the sikka as well as contributing by the transpiration of the planting to the actual cooling of the sikka. When considering possible solutions for the design of sikkak, the winter rains should also be borne in mind. Evidence from the Fez study demonstrates that the comfort advantage which deep sikkak have in summer months can be a disadvantage in winter due to the cold climate. I don’t know, but suspect that this is not necessarily true for the Gulf and its hot, maritime climate which is significantly warmer in winter than Fez in its high, inland location. While it should be borne in mind that the relationship of height to width in Qatar – even in the old quarters – was significantly less than the sikkak of Fez, the principle is likely to remain true in Qatar. With regard to environmental issues, let’s move on to the issue of orientation, bearing in mind that while the word in this context relates the built environment to the movement of the sun, air movement and wind is also to be considered. In Qatar the prevailing wind is known as the shamal and blows from the north-west. There are also, near the coast, on-shore and off-shore winds which tend to blow inland from the sea in the early morning, reversing in the evening. They are usually not as strong as the shamal, but can be significant in housing on the littoral. Open spaces, by definition, have little shade in them though there is, of course, the possibility of introducing shade. Where they are created within a housing area there is likely to be a hierarchy of sizes based on the uses to which the space is to be put. Unless there is a need for a structured space in which to carry out an activity that needs specific dimensions, it is nearly always better to keep spaces relatively small. Sikkkat should be narrow; open areas manageable – but both should be well suited to easy maintenance either through the municipality or by adjoining neighbours taking a specific interest in ‘their’ external space in a similar manner to that of a finaa’. Although there are theoretically similar solar loads before and after mid-day, it is the afternoon sun which appears the more aggressive due to the increase in ambient temperatures caused by its warming effect on the ground and buildings during the morning. This causes the ground and walls to radiate heat, an effect which can make those sitting near a wall to feel ill. As a general principle there should be an opportunity to use shade wherever there is a need to travel on foot, the shade being provided by a mixture of horizontal and vertical shade structures, fabric devices, by natural planting, or by a mixture of these devices. If there is a need to make a choice, then protection should be designed for the afternoon sun rather than the morning, though both would be an advantage. During a normal day there is activity in sikkak and open spaces associated with prayer times, movement to work, as well as the normal shopping and inter-house activity associated with meal-times and play. This should be considered in deciding upon optimal orientation to ensure that there is some form of shading to benefit those needing to move around. But it should also be provided in order to give additional choice to those living adjacent to public spaces. Given that the shapes of lots are rectangular and are most likely to be established on a rectangular grid in order to conserve land, the basic decision is usually made by planners of sites where the orientation will have been decided with respect to the primary and secondary road systems. In the illustrations to the side I have shown a preference for having horizontal shade elements on the east side of open spaces rather than the west. The reason for this is that there is already some shade provided by the wall on the west and south sides of an open area, but nothing to provide shelter on the east or north side. Shade can be provided either by constructed elements or, better, by planted elements as they introduce colour, smell and movement as well as moderating the environmental conditions. I have shown trees, but pergolas and other devices might be more suited to this purpose. This photograph is of a bus shelter on the north side of the Rayyan Road. On the face of it the design is attractive, providing protection from the wind as well as from rain during the winter period but, as you can see, there is little shade provided from the sun for those sitting inside it. The photograph was taken mid-afternoon in August. This particular design is in use both on the north and south sides of roads, as well as on east and west sides. It is evident that such a design will provide some protection from rain wherever it is situated but, with regard to solar shading, it will work best with this orientation. Any other orientation will produce disadvantages, some more than others as can be seen in the lower photograph where the shelter is facing west and those using it are having to stand behind it to obtain some relief from the summer sun. In whichever orientation the structure is placed the design will not always provide suitable solar shading. You would think that the principles relating to the provision of shade would be commonly understood by all designers, particularly those working in hot countries where the benefit of employing shade is obvious. This also applies to shelter from rain, of course, though the two problems really require different solutions. In practice few designers appear able to develop sound design solutions from obvious environmental problems. What is evident is that horizontal shading devices of this sort are likely to be more effective in keeping rain off those requiring shelter, than the sun. Yet nearly every shading device is designed to sit, in plan, directly over the people or objects to be shaded, even though the need is for the structure to cover a far greater area reflecting the shade needed from the solar path. These two sketches illustrate the problem showing, in the top diagrams, the pattern of shade in August at 10.00am, 1.00pm and 4.00pm for a south facing shelter and, below it, for a west facing shelter at the same times. This isn’t so much of a problem with certain materials such as canvas or their higher-tech fabric equivalents where it is relatively easy to design for the appropriate coverage, but these two diagrams illustrate the difficulty with less flexible materials and common design solutions. The proportions of a sikka can produce shade within it for much of the day, depending on its orientation. Where a sikka is straight then it is likely that, at some time of the day, the sun will be able to shine down it. The cross-sectional proportion will determine the length of time people using the sikka will be exposed; the narrower the proportion, the shorter length any exposure will be. Generally in Qatar, boundary walls of new properties are around 2.20m high, this height depending on a number of conditions, particularly the made up levels of the public area which can differ considerably over time. While it has been recommended that the width of sikkak should be no more than 1.80m clear, the tendency has been for sikkak to be constructed wider. This has been a particular characteristic of the Salata al-jadida layout south of the ‘C’ Ring Road and has not been to its benefit. These two dimensions were considered optimal, but on reflection would be improved if the walls were higher and, perhaps, the sikkak narrower. While there must be a minimum height of wall to provide security and privacy, the width of sikkak must take account of pedestrian traffic volumes. In housing areas with their relatively low densities, it is possible that the width of sikkak might be reduced to around a metre which would still allow people carrying food and packages to pass with a degree of comfort. While this might be sensible it would also be necessary to look at the length of run of each sikka in order to provide not just environmental comfort but also assure psychological comfort. The provision of effective shading can be made by altering the proportions of the heights of walls or buildings, as well as the widths of the area across which the shade falls. It is not uncommon in some parts of the region to find sikkak with narrow widths and the heights of the adjacent buildings several stories high. The higher the containing walls the more protection is afforded to passers-by from direct sun. At the same time close, parallel walls can enable a Venturi effect which will help in moving air into or out of adjacent buildings. In this sketch, drawn to illustrate the conditions mid-afternoon in summer, a figure is shown partly in shadow at the centre of a standard 1.80m sikka and with a standard 2.20m wall protecting him to his left. In the second diagram the wall has had to be raised a full metre in order to provide shade for the full body. In many places this will happen naturally with adjacent development but, with planning generally requiring structures to be built some distance – commonly 5.00m – away from a boundary wall, it may not always be possible to provide protection in the form of a two storey wall. And it may not always be appropriate to provide this protection when soft landscaping can be assumed to provide shading with time, as well as bringing to the sikka the additional benefits of movement, colour and scent as can be assumed from this photograph, copied from the top of the page. Most of the notes that are on these pages deal with the development in Qatar of residential projects at relatively low densities. Constructed within boundary walls, buildings are required to be set some distance away from the boundary in accordance with planning regulations. As a consequence of this the only shade created in the sikkak is a consequence of the boundary walls and planting, mostly within the curtilage of the adjacent properties. In developments in other parts of the Gulf there are far denser developments being planned and constructed in which there are the possibility to use cross-sections of reduced width in order to light and ventilate sikkak. Much of this initiative stems from a return to traditional solutions for housing in an attempt to make our urban environments less wasteful of resources, a key Islamic precept. Of course, there were dense developments elsewhere in the Arab world. There is the old tradition, illustrated here by a photograph I took in Baghdad some time ago, and also by more modern developments in cities such as Cairo where buildings have developed illegally and in close proximity. While developments such as these make environmental sense, traditionally there were issues of security, aural, visual and olfactory privacy as well as the risk of fire spread. These are perhaps more important now than they were then due to a very different life style enjoyed by most people. Larger amounts of disposable income are spent on housing, its contents and a modern lifestyle, and aspirations have led to higher expectations. But the problems these pose are not insuperable. These four sketches can be compared with the sketches just above. 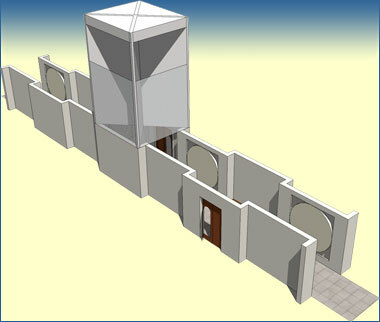 They are drawn to illustrate how two storey buildings might provide greater beneficial shade to sikkak with a notional width of 3.2 metres, the approximate width of traditional sikkak. The top sketch on the left shows the result of adjacent buildings being projected normally vertically, while that on the right illustrates a notional projection horizontally in order to restrict the width of the sikka, thereby creating more shade and reducing the intensity of the light within the pedestrian area. The two sketches below are developments illustrating, on the left, the addition of a pergola or grid system to moderate or regulate the light entering while, on the right, a reflective mesh would provide a similar function, but planting boxes are introduced to provide colour and scent to benefit both those moving along the pedestrian route as well as those living and working at first floor level. Body comfort depends upon three factors: temperature, humidity and the rate of air flow across the body. In addition the psychological factors that affect the way in which users react to visible or aural aspects in and around external spaces, whether or not they are accidental or designed, should be borne in mind. Glare should be avoided and planting used to soften reflection as well as introducing feelings of well-being through movement, colour and our normal responses to natural materials. Planting can be used to improve comfort levels quite dramatically. For instance, groups of date palms will create shade and a more comfortable micro-climate beneath them. Their movement and colour add to the feeling of comfort as can be envisaged in the first photograph of the pool of the Palacio del Partal in the Alhambra, Spain where the pool acts not only as an architectural element, reflecting the building behind it, but also as a psychological and environmental moderator of this part of the complex. But don’t forget that this part of Spain has a dry climate. So it is also worth bearing in mind the fallacy that the introduction of water is always beneficial. This has much to do with the illustrations seen in the West of fountains and pools in developments such as the Alhambra, Spain as can be seen here and above. In dry climates there is little doubt that devices that increase humidity can help cool the passer-by, and that the sight and sound of water also psychologically. But in humid climates the introduction of additional humidity through fountains and the like should be resisted unless there is a requirement for a more humid environment, perhaps associated with planting. However, the old Arab practice of providing drinking water for passers-by is a very good idea and can easily be provided from domestic supplies to devices on the public side of boundary walls. Not only does this help those moving around urban areas, but it also induces an element of comfort from the thoughtfulness of the provision. Apart from using buildings, additional shade can be produced over sikkak with the use of a variety of artificial and natural materials above or at the side of the areas to be shaded, as have been suggested in previous paragraphs. These might be introduced over any or all of a sikka, though it would make a great deal of sense to concentrate on parts of it such as pedestrian entrances to gardens. These are wicket gates providing access for family and servants to move from one part of a neighbourhood to another in relatively privacy. This simple sketch illustrates the possibility of using a large architectural feature which would create shelter over two wicket gates into different properties while maintaining visual privacy into their gardens. This type of intervention might be developed into a sitting area or dikka, perhaps with the addition of a water facility for those in need of a drink. This next illustration to the right shows how a simple pergola might span the pedestrian path at the position of a wicket gate. Pergolas such as these could be provided either by the Municipality or by the owners of the adjacent properties, with planting within those properties being trained to grow up and over the pergolas. Of course such an arrangement might span the sikkak at any point, but it would be preferable, at least, to cover areas of congregation such as entrances, drinking fountains and corners of the sikkak system. The judicious planting of trees would similarly provide shade, but with the added advantage of providing colour, movement and, perhaps, smell and sound. It is a common feature of boundary walls that plants rooted inside a property display on the outside of the walls, particularly bougainvillaea which has an additional benefit by providing added security or, as is illustrated in the lower drawing, the fronds of palm trees which commonly display within the sikkak. It is not easy to locate planting within a property having regard to the manner in which it can be used in a public space, but there is no reason why this might not be a consideration. It just requires that owners are made aware of the possibility and, should they wish, take advantage of the opportunity. In many ways it might be seen in a similar manner to the provision of drinking fountains outside a property, and a common characteristic of Islamic charity. Alternatively, a form of badgheer or wind scoop might be erected out of any suitable material to bring air down onto the pedestrian routes, preferably at nodes in the system and, incidentally, giving valuable shade. This sketch illustrates a schematic development of the traditional wind scoop taking wind from any direction and directing it onto a point in the sikkak system where those living in adjacent properties have access to it. A diagram illustrating the operation of a badgheer can be found on the Gulf Architecture page of this site with a little more detail relating to their design and construction. The scoop is particularly useful in this function and it is not uncommon to see them constructed of barasti or sacking in poor areas of the Gulf. Their design allows for wind coming from any direction to be channelled down into the area below. More usually they are found as elements of housing in tight, urban situations, but they function just as well over sikkak, and I have seen a crude form of them used this way in Dubai, constructed of barasti though, in that case, they were constructed to face one way only – obviously the direction from which the prevailing winds came. In Wakrah, a town south of Doha, there was a considerable amount of two storey development. The interesting feature of the development was that the first floor development was arranged with its longer length running in a north-south direction. The west face was organised with only simple, flapped badgheer s permitting the circulation of air while preventing rain getting in as well as ensuring privacy. The east side of the first floor development was open in the style of a majlis with windows to floor level looking straight out onto the sea. The buildings seem to have been designed to take advantage of the on-shore breezes, turning their backs on the strong, afternoon, western sun in defiance of the prevailing wisdom that buildings in hot climates are best designed to have their long axes oriented east-west. The standard way in which boundary walls were constructed was with reinforced concrete columns linked by concrete blockwork, plastered and painted. The Senior Staff Housing in the New District of Doha has pre-cast concrete panels linking vertical columns and standing on a common base to create levelling of the wall. The columns create a certain amount of stability to the walls, but there is a better way of producing lateral stability, that is by cranking or articulating the wall. This series of graphics illustrate one way in which this might be effected. The sikkak are shown as a notional 1800mm wide, face to face system, based on a 2000mm wide layout. These first two illustrations give an overview of a part of the system showing how the width of the sikka will vary between 1800mm and 2600mm if the setback is 400mm. The advantage of this is that there is modelling to the sikkak, and each property owner might have an entrance to the sikkak from the property garden. Although I have said this is an alternative to pre-cast columns, the articulated wall is also seen as a pre-cast system. These next three graphics illustrate a notional perspective view of each side of the sikka. The wall is drawn a nominal 2500mm high from ground level, this allowing for some making up of the garden within the property. The wall is shown blank on the property side but modelled on the public side in order to reduce costs. There is no reason, of course, why the panels might not be modelled on both sides. This modelling would be created in the moulds prepared from naqsh panels as has been carried out by the municipality and other agencies on new building projects. There is a strong opportunity to enhance not only the character of the sikkak but to enhance the opening to the property gardens through the use of naqsh panelling. Here I have shown panelling as well as a relatively traditional door complete with its enf and wicket gate. This does not mean that every house will have a door opening into the garden but, as I have argued elsewhere, there is a tradition of opening onto sikkak both from within houses as well as from external areas. There is a good case for such entrances being located near to the kitchens of the house so that meals may be brought in or taken to family and neighbours living nearby, a strong tradition. The structural effect of cranking the wall is to provide a significant improvement over a columnar linked system. Lateral stability is significantly improved over the standard, square column where the column is, in effect, now rectangular. In the process recesses are created on both sides of the wall giving the possibility for planting by property owners as well as the municipality within the sikkak. My guess is that many of those on the public side would be planted by the owners as there is a strong tradition in Islam to provide benefit to others. It is common to see drinking water provided for passers by property owners, and this would extend that principle. Already some owners plant outside their properties in the Senior Staff housing area. These two graphics illustrate the effect that the pre-cast units might take, showing a little more detail. All corners are chamfered to reduce damage and ease the process of taking units out of their moulds. Faces would be patterned with naqsh, as I’ve mentioned previously, and the number of units would be kept as small as possible to keep costs down. With regard to the naqsh patterns, these can be produced with a variety of different patterns by using a range of inserts in the moulds, that could also have other effects such as identity and signing built into them if this is a requirement. Traditionally, as I have written about elsewhere, there was no signing in the old areas but, with the development of governmental systems, there is now a plethora of signs relating to utilities, signing and the like. This sketch shows a possibility for developing the sikka, providing shade over the garden entrance from the sikka. Such units could be provided either by the government or by the property owner though, in the latter case, there is a small legal problem to be resolved. Not only would it provide shade and a natural resting place but create additional visual interest within the sikka. Lighting and, perhaps, a dikka could also be provided as could drinking fountains, a traditional benefit usually provided by building owners for the benefit of travellers. This last sketch develops the shading principle and shows another way of bringing both shade as well as air into the sikka system. In this case I believe it would have to be provided by government and there would be benefits in having a common pre-fabricated design. I have to admit that this may be considered as an extravagance, but its concept would certainly be in line with the development of traditional architectural and urban design for Qatar, and the improved air flow would benefit those moving around the sikkak while providing shade, making the system even more attractive to those living in and having business within the housing areas. The chief point I am making here is that the sikkak, taken as a system, lends itself to considerable development to benefit the people who live adjacent to it. Today, Qatari interior designs are, as you might expect anywhere, a mixture of styles relating in the main to the tastes of building owners. Bear in mind, however, that only a generation ago buildings were basic, and the range of materials available for their interiors, very limited. The predominant styles introduced to the country by the leading furniture stores tended to be heavy in terms of both their form and finish. Three piece suites were the standard way of buying seating, both for the sitting rooms within the private parts of the house as well as in the majalis where enough suites would be bought to line the periphery of the room. Some owners maintained what they termed an ‘Arabic’ room, a modern interpretation of their individual views of what was central to their past. Of those I have seen, they tended to be based on a northern Arabic style, rather than Qatari; but the essentials of dikka in the form of peripheral seating with associated masaanid, rounded arches, zulij, naqsh and zujaj on the walls, sijaad or kilim on the floors, and mushrabiya in openings or as screens, with decoration provided by items such as akhraaj and rows of matching della, provided the basic designs. Associated with them was always a hearth for making traditional qahwa and shy, either at the end of the room or immediately adjacent to it. Leaving aside the ‘Arabic’ room, the end of the last century saw the construction of a large number of houses for first generation users of these kind of buildings, as well as concomitant offices and the like. All these buildings required furnishings and the demand was so great that importers found it hard to keep up. In fact they could sell anything they wanted so, to a large extent, many houses and offices were furnished to the taste of the importers and their agents. I mentioned the heavy designs that were generally favoured; this was seen not only in massing but in texture and materials. The only light forms of furniture were seen in chromed steel and glass – which tended to be coffee tables and shelving – and plastic or, particularly, lacquered finished furniture – which was seen in dining chairs, tables and shelving where they formed a part of the designs. Lacquer, of course, is easily scratched and didn’t last that long as a popular finish; metal and glass took over the function while wood was increasingly seen. Wood was used in much of the furniture at that time. There were two reasons. One is that there was a considerable carpentry and joinery industry staffed in the main by craftsmen from the Indian sub-continent, and there seems to have been sourcing from the Far East which brought in teak furniture, often with heavy carving. But new joinery companies started up and lighter looking furniture using not just teak sources, but also lighter timbers such as oak and beech were introduced. Most of the furniture produced from these companies tended to be to special order and didn’t make a serious impact on the market in terms of coverage, but did have an effect in terms of taste. suitable examples of how to use the furniture and fittings. Income to Qatari families increased dramatically with the development of the oil and gas based economy, Qataris now enjoying one of the highest per capita incomes in the world. This fuels their improved life styles and the expenditure on, among other things, furnishings, fittings and interior design. I have written elsewhere about the way in which Qataris are now able to enjoy themselves outside the house. In urban areas this means that they are moving in and around buildings that have much in common with what Rem Koolhaas terms transient architecture – hotels, hostels and airports. The character of these buildings is international in their design styles and it is this that Qataris are now extremely familiar with. It is not surprising, therefore, that much of their domestic design selections are made on the basis of what they have seen and enjoyed in these kinds of urban development. Although I have been talking about the interiors of Qatari houses, you should be aware that there is a significant amount of housing provided for expatriates. By and large this is different in character from Qatari housing as it is usually bought in sets, the housing sets being put together by retailers for given budgets. Residential interior environments tend to have a standard feel to them, though they generally provide all the basic units with which Westerners are familiar. This first photograph illustrates a relatively typical arrangement for the ground floor arrangement of a middle-management level, expatriate house on a gated estate. Note the heavy coloured finish of the kitchen units and sofa. The floor is either terrazzo or a similar finish, and the walls and ceilings plastered. Hard surfaces predominate and this has an important effect on the internal environment and feel of the housing. When finishes are inexpensive, the interiors appear to be mean and sparse as few people have the resources to complete the fitting out and, as expatriates, are reluctant to upgrade finishes, furniture or fittings for the eventual benefit of others. It also means that tenants may not treat their houses as they would if they were owners, a common problem in the West. This photograph illustrates a basic main bedroom arrangement with a relatively tight distribution of furniture. What I have not shown in the photograph is the relatively high ceiling which helps to counter the floor plan problem. Here is a photo of one of the minor bedrooms with furniture matching the main bedroom. One of the features I’ve noticed in expatriate housing schemes is the poor provision of socket outlets, communication outlets and switches. Not only are there likely to be very few in a room, they are not always situated either in the right place or, better, in locations where they would provide sensible choices for those wishing to use an alternative arrangement in their rooms. Bedrooms appear to be particularly prone to this problem. There is, usually, a considerable amount of personalising with items that can be taken with them when staff leave. Where companies furnish housing for their own staff, the fitting out tends to reflect the countries those companies come from and, with some companies, can result in very attractive and usable interiors for the tenants, particularly when there is the necessity to socialise for business reasons. This photo, admittedly of an office, shows a light touch in the selection of a veneered finish. Offices are readily personalised, much of it of necessity, but it should also be borne in mind that not only do expatriates have the natural requirement to ‘own’ a space, but there is the added psychological necessity to compensate for having moved to a very different environment. Now, as you will have seen, talking about Qatari interiors is a difficult area for me to deal with as I can’t post photographs of the interiors of Qatari houses. I hope you will take my word for what I’ve written on styles of the interiors and the trends that are likely to be influencing them. You should also read this in parallel with notes I have made on the Society page because where Qataris live has to be understood in the context of how they live. What follows is a small diversion relating the manner in which traditional Qatari design might be adapted. Here I’m putting up a couple of examples of materials intended for use on the interior of a Qatari building. These particular ones are samples produced for a major project and are not intended to be considered for normal use. However, I think they are well worth looking at to see how designers have interpreted traditional Qatari patterns and used them in a variety of combinations of materials providing colour, different textures and variety within a very simple framework. Most of the patterns are based on four-point geometry. The designs could be easily replicated with less expensive materials and, provided they are not used extensively within a single space, they would work well to produce a hint of the past of the country within the home or office. This first example was fabricated from bronze and marble to create a small panel about 300mm square. Based on four-point geometry it is a relatively simple form having much in common with traditional Qatari naqsh, and might be suited to forming a focal point or an element within a floor or pavement. These first three designs are rich and would not be suited to contiguous placing. This next example was also based on four-point, quatrefoil geometry, a very common feature of Qatari naqsh panels within, usually, a majlis. What makes it very different is the use of diagonal stripes and, of course, the amount of colour. Again this would be suited to a similar location as that above it, as a decorative panel in a more plain surround. This is a darker design than the previous two and incorporates a more delicate material in the form of the mother-of-pearl inlay. Because of this it isn’t suited to using on a floor but is envisaged as being a part of a heavy piece of furniture such as a desk or table. Once again the basic geometry is four-point, this time with the more obvious container of a square set on the diagonal. This fourth example makes use of a resin with a crackled finish to provide a strong texture in order to contrast with the simple colours and pattern used both within and adjacent to the material. Within the finish a continuous frieze has been designed consisting of a running, interlocking semi-circular design, providing in its simple detailing, a very Qatari feel to the finish. It is a relatively common detail found in traditional carved naqsh work. This simple design provides a very rich pattern suited to a wall or similar finish. The blue background, like the example above, has resonance in a favourite colour used on Qatari buildings as well as bringing in the colour of the sky. The gold and silver running lines create a double-axe head detail which is very common in Qatari buildings. The raised threads introduce a shadow which reinforces the richness of the pattern. The double-headed axe design above is a beautifully simple device for providing lineal or area patterns. Here the device was developed for some small windows and associated with four colours which are representative of colours naturally found in Qatar. The orange represents the desert, the green, cultivation, and the two blues those of the sea and sky. The Prussian blue, the only transparent colour, is graded in reference to the aerial perspective created by dust in the air though reversed in order to provide more obscurity at the lower levels. Wood was not used as panelling on traditional Qatari buildings. Doors, which were invariably made of teak, were left as boards and occasionally had a small amount of carving on them, though the enf was often heavily carved. Windows were often protected with panelled wood shutters but, apart from incorporating a smaller enf, they were not carved. This example has a similar depth of modelling as a naqsh panel would have, the overall geometry being based on four- or eight-point geometry. The dark finish makes it appear old to a Western observer and it would be interesting to see it carved into a lighter wood such as beech or oak. By contrast, but having a similar generic basis, here are two pieces of material for use on curtains or soft furnishings such as seating or cushions. Both examples are made in materials that are beige and blue, these colours being very popular in Qatari interiors. They are commonly seen as the colours of na’in carpets which is likely to be where these colours were taken from. The beige material has a very strong texture which is reinforced by the embroidered blue detailing, producing a very rich effect. Again, the pattern is based on four-point geometry. This sample incorporates a rich running design of embroidered double-axe heads alternating with plain satin for contrast. It would be suited to areas such as cushions, curtain tie-backs and the like. It is not a material that should suffer heavy use and it is one that would have to be carefully sized in order that the pattern is not broken into at junctions. And, finally, here are two contrasting materials, porcelain and bronze. This first example contrasts strongly with the finger-plate below in both its materials and pattern. Based on four or eight point geometry the pattern has had to be distorted as it moves around the rim, though an effort was made to keep the orange octagonal pattern more or less accurate. It is not particularly successful. The second example is a rough model of a finger-plate intended for incorporation on a door. The finger-plate has been cast in bronze and has a deeply defined pattern based on a simple geometric running pattern, one which is readily found in traditional buildings in Qatar. Screw holes to fix it are located on the lower level of the pattern in order to be less conspicuous. In use this panel would have been highly polished, the top surface contrasting with the un-polishable lower surfaces.